Wyoming’s struggling mule deer populations are receiving significant attention from University of Wyoming researchers, the Wyoming Game and Fish Department and others, with at least five studies underway that could assist efforts to enhance deer numbers and their habitats. This week, scientists with the UW-headquartered Wyoming Migration Initiative (WMI) and partners are scheduled to begin capturing mule deer as part of those studies. And members of the public will have an opportunity to closely follow the work. As time and cell phone connectivity allow, the researchers plan to live-tweet the Dec. 11-17 research effort and provide Facebook posts about the deer captures multiple times a day. The tweets will be by WMI Director Matt Kauffman, a UW professor and U.S. Geological Survey scientist, at @wyokauffman, using the hashtag #wyodeer. Game and Fish biologists and wardens involved with these studies and the WMI also will tweet from @wgfd. The USGS, also a funder of two of the studies and tweeting from @usgs, will help promote the discussion to a broader national audience, especially with respect to the influence of ecological drought on wildlife. WMI’s Facebook page is at www.facebook.com\migrationinitiative. The photos, videos, updates and Twitter feed will be posted to a dedicated WMI webpage, www.migrationinitiative.org/content/week-wyoming-deer-capture. -- The impacts of energy development on deer that winter on the Pinedale Anticline. This study is in its 15th year. -- The nutritional dynamics of the famous Wyoming Range mule deer herd, to better understand how many animals the range can support. -- The impacts of ecological drought on the spring green-up of forbs and grasses, and how that affects deer as they migrate from low-elevation winter ranges to mountain summer ranges, as well as summer forage quality. -- Long-term monitoring of the newly discovered, 150-mile migration of mule deer from the Red Desert north of Rock Springs to summer ranges in northwest Wyoming. -- How energy development affects migration behavior of the Baggs mule deer herd, which migrates to summer ranges near Atlantic Rim and the Sierra Madre Mountains in southern Wyoming. Kauffman says the group will provide information on the objectives of each study, and what has been learned from ongoing research, through short video interviews, maps and graphics. He’ll also tweet links to existing papers, reports, news articles, interviews, YouTube videos and other information relevant to each study. Where possible, the group will provide general background about the study areas, including the Wyoming Range and the Red Desert. The public -- and other groups interested in mule deer ecology, migration and management -- are encouraged to add comments via Twitter or Facebook throughout the weeklong research effort. Kauffman describes mule deer as “the long-distance migrants of Wyoming,” so GPS tracking is particularly valuable in identifying migration patterns and the impediments migrating animals face. The day after each capture, the researchers will tweet and post updated maps that include the migration routes that these winter range captures have revealed. 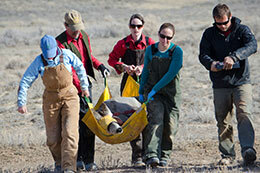 The studies are co-led by Kauffman, head of the Wyoming Cooperative Fish and Wildlife Research Unit under a dual appointment with the USGS and UW’s Department of Zoology and Physiology, where he is an assistant professor; Kevin Monteith, an assistant research professor with the Cooperative Fish and Wildlife Research Unit and the Department of Zoology and Physiology; and Hall Sawyer, research biologist and project manager with Western Ecosystems Technology Inc. Primary collaborators are the Wyoming Game and Fish Department, the USGS and the Wyoming Bureau of Land Management. 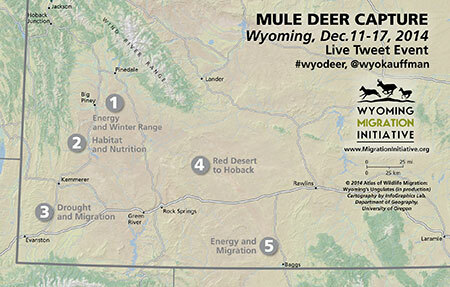 This map shows the mule deer winter ranges where deer are scheduled to be captured. Migration data from each study will be added to this map as the research effort progresses.